Welcome to Big Olaf Creamery of Lakewood Ranch! When you're hungry for great Homemade Ice Cream, be sure to stop by Big Olaf Creamery in Lakewood Ranch. Our Premium Ice Cream is made with the finest ingredients and you will never hear the words "good enough" because good enough just isn't good enough for us. Every delicious scoop we prepare for you is our way of saying you deserve the very best! At Big Olaf, we believe in treating every customer that walks through our doors like they are a member of our family. We have created a warm and friendly atmosphere where you can enjoy Sarasota's favorite ice cream with family and friends. After taking a leisurely stroll and exploring the many unique shops on Main Street at Lakewood Ranch, what could be better than relaxing with a tasty, freshly made Waffle Cone overflowing with your favorite flavor (or flavors) of Ice Cream? We offer over 60 flavors including Premium Ice Cream, Italian Ice, Sorbets and Frozen Yogurts. Sugar-free and fat-free flavors are also available. 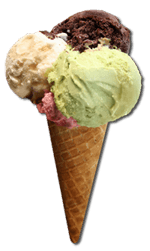 You can enjoy your favorite Ice Cream flavors by choosing Cups, Cake Cones, and Homemade Waffle Cones and Waffle Bowls. Our specialties include: Delicious Brownie a la Mode, Amazing Banana Splits, and the best Sundaes, Milkshakes, Malts, Floats, Coolers, and Real Fruit Smoothies you can find.